Gated Sampling Star-Hub The Gated Sampling mode The Star-Hub is an additional module allows data recording con- allowing the phase stable synchroniza- trolled by an external gate tion of up to 8 boards of a kind in one signal. Data is only record- system. Independent of the number of ed if the gate signal has a boards there is no phase delay be- programmed level. In addi- tween all channels. The Star-Hub dis- tion a pre-area before start tributes trigger and clock information of the gate signal as well as a post area after end of the gate signal between all boards to ensure all con- can be acquired. The number of gate segments is only limited by nected boards are running with the the used memory and is unlimited when using FIFO mode. same clock and trigger. All trigger sources can be combined with a logical OR allowing all channels Timestamp of all cards to be the trigger source at the same time. The timestamp function writes the time positions of the trigger events in an extra memory. The timestamps are relative to the start of record- ing, a defined zero time, ex- ternally synchronized to a radio clock, an IRIG-B a GPS receiver. Using the external synchronization gives a precise time relation for acquisitions of systems on different locations. Pattern trigger Pattern triggers can be defined for every bit of the digital input da- ta. Each input for the pattern trigger can be set to high or low, de- pending on the expected level, or "don't care". In addition, edge detection can be used to allow triggering on rising , falling or both edges. The pattern trigger can be used to recognize a huge variety of trigger events. External trigger input The boards can be triggered using an external trigger input, that has the same exact interface capabilities as the installed data lines, either single-ended with programmable threshold or differential. External clock input and output Using a dedicated input line, that has the same exact interface ca- pabilities as the installed data lines (either single-ended with pro- grammable threshold or differential) a sampling clock can be fed in from an external system. Additionally it’s also possible to output the internally used sampling clock on a separate line to synchronize ex- ternal equipment to this clock. State clock The state analysis mode allows to use an external clock to synchro- nously sample the applied data. In this mode the clock is allowed to have gaps, as long as the minimum required high and low times are met. To simplify the synchronous sampling of the data, the in- coming clock signal can be shifted/delayed with regards to the da- ta, to allow proper data capture. Reference clock The option to use a precise external reference clock (typically 10 MHz) is nec- essary to synchronize the instrument for high-quality measurements with external equipment (like a signal source). It’s also possible to enhance the stability of the sampling clock in this way. The driver automatically generates the requested sampling clock from the fed in reference clock. Block diagram single-ended input version Order Information The card is delivered with 4 GByte on-board memory and supports standard acquisition (Scope), FIFO acquisition (streaming), Multiple Re- cording, Gated Sampling and Timestamps. Operating system drivers for Windows/Linux 32 bit and 64 bit, examples for C/C++, LabVIEW (Windows), MATLAB (Windows and Linux), LabWindows/CVI, .NET, Delphi, Java, Python and a Base license of the os- cilloscope/logic-analyzer software SBench 6 are included. Drivers for other 3rd party products like VEE or DASYLab may be available on request. Adapter cables are not included. Please order separately! PCI Express x8 Order no. Channels Interface Standard mem Sampling Clock State Clock M4i.7710-x8 32 Single-Ended 4 GByte 125 MBit/s 125 MBit/s M4i.7720-x8 32 Single-Ended 4 GByte 250 MBit/s 250 MBit/s M4i.7730-x8 32 Single-Ended 4 GByte 720 MBit/s 700 MBit/s M4i.7725-x8 32 Differential 4 GByte 250 MBit/s 250 MBit/s M4i.7735-x8 32 Differential 4 GByte 720 MBit/s 700 MBit/s Options Order no. Option M4i.xxxx-SH8ex (1) Synchronization Star-Hub for up to 8 cards (extension), only one slot width, extension of the card to full PCI Express length (312 mm). 8 synchronization cables included. M4i.xxxx-SH8tm (1) Synchronization Star-Hub for up to 8 cards (top mount), two slots width, top mounted on card. 8 syn- chronization cables included. M4i-upgrade Upgrade for M4i.xxxx: Later installation of option Star-Hub Cable Order no. Option Cab-v68-v68-100 Shieleded twisted-pair cable VHDCI to VHDCI, 100 cm, 125 Ω differentiell, 90 Ω single-ended Software SBench6 Order no. SBench6 Base version included in delivery. Supports standard mode for one card. SBench6-Pro Professional version for one card: FIFO mode, export/import, calculation functions SBench6-Multi Option multiple cards: Needs SBench6-Pro. Handles multiple synchronized cards in one system. Volume Licenses Please ask Spectrum for details. Software Options Order no. 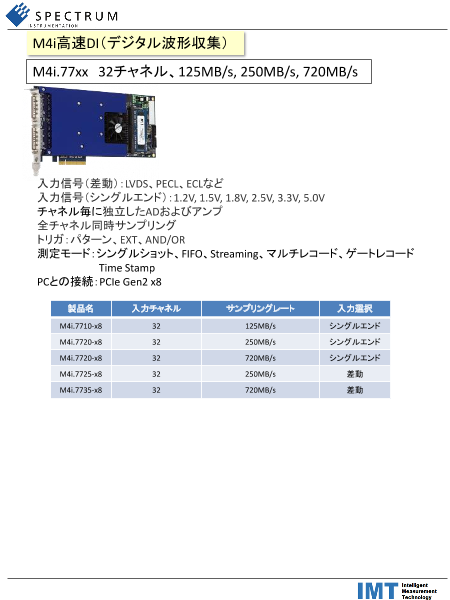 SPc-RServer Remote Server Software Package - LAN remote access for M2i/M3i/M4i/M4x/M2p cards SPc-SCAPP Spectrum’s CUDA Access for Parallel Processing - SDK for direct data transfer between Spectrum card and CUDA GPU. Includes RDMA activation and examples. Signed NDA needed for access. (1) : Just one of the options can be installed on a card at a time. (2) : Third party product with warranty differing from our export conditions. No volume rebate possible. Technical changes and printing errors possible SBench, digitizerNETBOX and generatorNETBOX are registered trademarks of Spectrum Instrumentation GmbH. Microsoft, Visual C++, Windows, Windows 98, Windows NT, Window 2000, Windows XP, Windows Vista, Windows 7, Windows 8 and Windows 10 are trademarks/registered trademarks of Microsoft Corporation. LabVIEW, DASYLab, Diadem and LabWindows/CVI are trademarks/registered trademarks of National Instruments Corporation. MATLAB is a trademark/registered trademark of The Mathworks, Inc. Delphi and C++Builder are trademarks/registered trademarks of Embarcadero Technologies, Inc. Keysight VEE, VEE Pro and VEE OneLab are trademarks/registered trademarks of Keysight Technologies, Inc. FlexPro is a registered trademark of Weisang GmbH & Co. KG. PCIe, PCI Express and PCI-X and PCI-SIG are trademarks of PCI-SIG. LXI is a registered trademark of the LXI Consortium. PICMG and CompactPCI are trademarks of the PCI Industrial Computation Manufacturers Group. Oracle and Java are registered trademarks of Oracle and/or its affiliates. Intel and Intel Xeon are trademarks or registered trademarks of Intel Corporation. AMD and Opteron are trademarks or registered trademarks of Advanced Micro Devices. NVIDIA, CUDA, GeForce, Quadro and Tesla are trademarks/registered trademarks of NVIDIA Corporation.